Its been a while since I’ve talked about FOG on here. The last 4 or 5 months have been busy and filled up with term-time activities as well as fixing many issues we have had. So FOG is still very much in use where I work, but there have been some changes to how we use it and how it operates. Another thing that has been done is to increase our storage capacity, which might come into a separate post, but the long and short is that our entire infrastructure has been reinstalled in some form or other, including FOG. The following steps should help anyone who has already installed Ubuntu 14.04 on their system to set up the free computer cloning and computer management package called FOG. You can find more detailed information, including what you can actually do with FOG, elsewhere – for example on the FOG Wiki – so this is just a guide to get it up and running and to look at some of the problems that may be faced in doing so. I recommend using this post instead of my previous posts to get started since its more up to date and some of the original issues just don’t apply anymore. You are then told to navigate to your FOG page which is at http://<fog address>/fog/management before you finish installation. This is all you need to do on the web side for now. You can go back to your installation and continue, which will finish the installation! FOG won’t start working properly just yet. There are a few settings that need to be changed and some additional setup to make things work as you would expect them to. After you’ve finished, issue a sudo service apache2 restart command and you should now be able to just navigate to the address of your FOG server. By default, FOG uses a default username and password of fog and password in order to get into the FOG web UI. You will likely want to change this password under User Management in the FOG web UI settings, but more crucial is that you have a corresponding system account. You can either change the account FOG uses for everything, or just create a system account (with the same details for the accounts as specified in /var/www/fog/lib/fog/Config.class.php. Give it the same password that you are using in the FOG web UI. The other settings don’t matter, they can be blank. Without this user, you’ll get a variety of errors on the system, I found. Previously, I had used “fog” as the default username for the system, but I like to try and keep these things separate so that I can understand better what is going on. You may have noticed that the original drive size of 40GB was very small. It is – but that’s because I don’t actually want to store the images on the same disk as the rest of FOG. This is so that we can move the images around and back them up much easier than the FOG server and not bloat the rest of the FOG system with these files. Plus, we can offload this to a separate storage device entirely, even located elsewhere. FOG maps everything to using the root /images folder by default. Instead of using an actual folder for /images, its possible to mount a separate drive as /images – so everything will still point to the same place, but the storage location is different. Note if you’re using a VM: make a new disk, something large like 1TB, and also make it Independent. This way, changes are persistent and the disk is much easier to move around to other systems. Restart the VM. Check the output of mount to see if the disk is mounted as expected. Finally, I set the permissions for the folder so that the user fog owns it and only the specified user and group can access it. I talked about this previously under “proxyDHCP”, and I’m just going to briefly mention what is written here, but essentially you need to configure FOG to respond to requests from other subnets. Refer to both of those links and it should be fine. The following are common issues I have noticed with other people or encountered myself, mostly specifically with Ubuntu 14.04 and FOG 1.2.0. Please feel free to comment on or correct/elaborate on any of these but I’ll try and cover them as briefly and as well as I can! This will almost certainly happen when you first start trying to boot from FOG. In an earlier post, I talked about moving from pxelinux to undionly – but one thing that wasn’t apparent at the time was that you may have a missing file. In /etc/dnsmasq.d/ltsp.conf, you can specify the bootfile. I checked this and the file specified, undionly.kpxe, is definitely in the /tftboot/ directory, which is where tftp requests can get their files from. You can also use tcpdump on the FOG server to see traffic for a given host using tcpdump -i eth0 | grep 192.168.31.100 . This will tell you the kind of traffic that is going on between hosts. Note: if you’re using SSH, you want to exclude your own machine by using grep -v <ip of your own machine> otherwise you’ll be generating the same traffic that you’re recording! So if everything works ok, what is wrong? For more information, see this post I made on the FOG forums which should explain a bit more or some of the responses to a similar issue. I personally would suggest to remake the server again but if this isn’t really an option, the above should fix things for you. A frequently occurring problem after installing dnsmasq is that despite the interface file configured to point to a specific nameserver, the host is unable to look up any hostnames. This means no package upgrades, namely. f you look at /etc/resolv.conf (which is actually /run/resolvconf/resolv.conf), it seems that the nameserver is 127.0.0.1. Inside /run/resolvconf/interface/ are all of the interfaces that could be used and inside /eth0.inet, the right settings are configured. However, there is a file called lo.dnsmasq, too – which has the offending address inside it. What seems to happen is that the interface order has changed at some point so that a load of these loopback interfaces take priority over any physical adapters. Resolvconf gets its settings from numerous sources, which are ordered in precedence here in /etc/resolvconf/interface-order. The solution is not to just remove the lo.dnsmasq, but to change the order in the interface-order file to make eth* the priority. 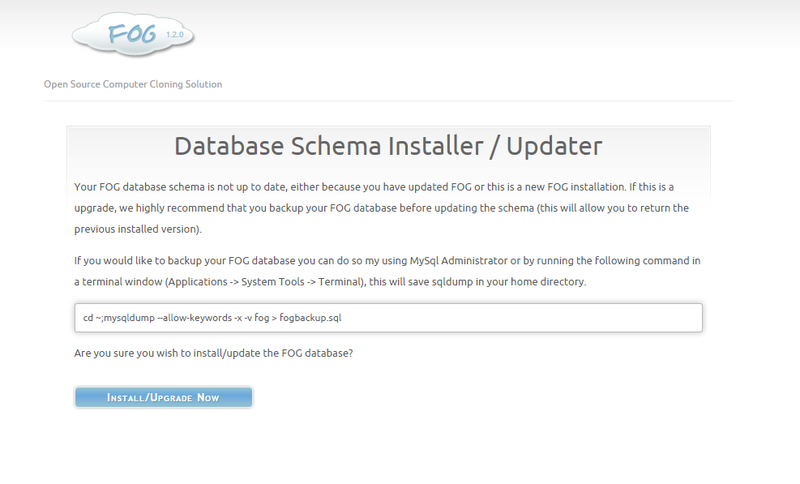 Another common error people seem to get – with apparently no commonly discernible cause – is the following screen with “Your FOG database schema is not up to date..”. when opening the FOG web UI. For me, it most often occurred after a system reboot after initial installation – and it wouldn’t always happen straight away, sometimes a few minutes would pass. There seems to be a few fixes and a few causes, but if you look at the running processes and filter out mysql processes, you’ll see there are actually a few instances already running, when you should have only one. You can issue this command, based on what Tom Elliott suggested here. Afterwards, run dpkg-reconfigure mysql-server-5.5 and use the same password specified in the fogsettings file to reset the mySQL database password. There is a lot of similar issues documented on the FOG forums if you’re interested more in the issue. I think this should fix it but I would be interested if anyone else has another idea as to the cause of it. It seems – at least on Ubuntu 14.04 with FOG 1.2.0 – that the FOG task scheduler, multicast manager and image replication services just don’t start. Well, ok they do start, but then they stop quite quickly. Log files are generated but since the service abruptly stops, you get nothing more than a few lines. You can manually start the services yourself, and you’ll get some error about a process ID not existing, but you want to be able to do this automatically. Add this to /etc/rc.local to force restart of the FOG services 10 seconds after system startup. By default, snap-ins are limited to being really small. But if you want to use snapins to deploy large files, you will need to edit /etc/php5/apache2/php.ini to increase the limits. The amount of POST data you can send and the file size limit needs to be changed, so find the following lines and set them to the following values (you can go higher or lower, of course). FOG on a virtual machine? This really isn’t a hugely important point since this installation guide applies for physical machines too, but one of the things to consider in this post is that it was decided to move FOG to a VM. There is now High Availability – which, essentially, means that if the host running FOG fails then a second host takes over and FOG should keep running seamlessly. Additionally, we can now take advantage of our new storage provision and move some of the images onto this. My configuration settings are very lean, get still quite generous, with only a single dual core virtual CPU and 4GB of memory. The hard disk space is similarly small at only 40GB thin provision; the reason for this will be apparent later. Finally, we can create snapshots in a VM and migrate it around and back it up elsewhere by downloading the entire set of virtual disk files. I did some quick bandwidth test using iperf to see what sort of throughput could be achieved on the system and the result was suggesting speeds of 624Mb/s, which perhaps could be improved later but is nevertheless a reasonable way to 1Gb/s speeds (although I haven’t done many tests over other systems to determine latency around the site). Hopefully this will be enough to get most people started; if anyone has any questions do feel free to ask or post over on the FOG forums (which have just recently been updated and will likely have broken a lot of my links in older posts!). However, soon I will likely be checking out the new FOG and the new client! Thank you so much for posting this. I experienced many of the problems you stated above and your solutions worked like a charm for me! Hello, I installed Fog 1.2.0 for Ubuntu 14.04 and made all the settings that are needed to install the program. The problem is that when I finished installing the software through the console, came to the passage where he gives me a direction to manage my server, I’ll address but does not show me the page. I’ve tried everything but can not find solution. So, as a last resort I turn to you thinking that perhaps a development problem in updating 1.0.1 to 1.2.0 or maybe I have made a bad configuration. Thank You. Excellent content, any chance to provide as pdf too? Hey, this guide was very helpful to me. When booting using a NIC in order to reach the PXE server I get the error: “PXE-E55: proxyDHCP did not reply to request on port 4011”. the only solution to this, according to MS and other posts is to remove DHCP option 60,66 and 67.
well, in both situations (with the above dhcp options and without) I get the same error. ** I configured FOG typically, dedicated VM, DHCP is on different server, same scope/subnet. That is some nice work you have done here. I have almost mimicked your install to the letter but having overcome DNS/DHCP issues successfully and initially was able to upload an image .. it all then failed when I tried to upload a second image. guess what, the script that runs when you issue an upload task just hangs when it tries to mount to the /images on /dev/sda !! Why is the upload script coded to go to that point? Honestly everything else checks out…how do I point that to go to /sdb? I am having the exact same issue. I add another HDD to increase the storage capacity. The PXE boot when it is looking for Hard Disk: /dev/sda – it hangs… I need to have it point to /dev/sdb… Is there another config file we need to edit?